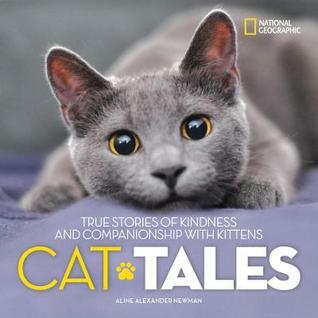 Cat Tales: True Stories of Kindness and Companionship with Kitties by Aline Alexander Newman is a small book of stories about enigmatic cats and their owners. The introduction talks about how many people fail to understand the behaviors of cats, especially when they act erratically. It talks about creating an environment that appeals to their wild instincts as part of an effort to avoid problems that can occur with cat ownership. Many of these stories are a testament to the bond between cats and their owners, like Holly who was spooked while on vacation in Florida with her owners and disappeared. After a good Samaritan found the cat and had the ID chip scanned, it was discovered that Holly had walked 190 miles in 62 days, trying to return home from Florida. This collection includes not only stories about cats and their owners, but statistics about perceptions of cats and expert explanations about certain behaviors. In Holly’s case, she used her hunting instincts to find her family, and her tenaciousness kept her going even when she was near starving. For younger readers, there’s even information on cartoon cats and why and how they became famous, such as Grumpy Cat. Cat Tales: True Stories of Kindness and Companionship with Kitties by Aline Alexander Newman is for ages 8+, but if read together, it can be a good night times story book for kids who love cats and are younger than age 8. My daughter is fascinated with cats, even tough our dog is no friend to cats. This was a perfect book for us to read together. National Geographic Kids: 125 Pet Rescues for review. This is a collection of hilarious and heartwarming stories of dogs, cats, and all types of pets given a second chance, and the human animal lovers who rescued them. From the dog who saved her owner from a fire, to the cat that plays the piano, to the cow that thinks it’s a dog, discover incredible stories of animals in need who went on to become beloved pets. These uplifting tales are paired with amazing photos and loads of animal facts. Kids learn all about how to be kind to our animals friends and the importance of being a responsible pet owner. There’s tons of furry, fluffy, feathery fun on every page, including tips on how to help save animals in need! Cat Tales: True Stories of Kindness and Companionship with Kitties by Aline Alexander Newman with a foreword by Mieshelle Nagelschneider for review. We humans love our cats and these surprising true stories will prove our cats love us back! This collection of tales of playfulness, friendship, heroism, and inspiration is sure to touch the soul, tickle the funny bone, and inspire animal lovers everywhere to be the best kitty caretakers and companions they can be. There’s Bambi, whose owners taught her to respond to commands in American Sign Language; Millie, who loves exploring the outdoors and goes rock climbing with her owner; Leo, a rescued lion who changed the life of one South African family forever, and more. Seasons of Joy: Every Day Is for Outdoor Play by Claudia Marie Lenart, a kids poetry book that I edited. The pure and simple delight of children playing outside is captured in needle-felted wool paintings created by Claudia Marie Lenart in Seasons of Joy: Everyday is for Outdoor Play. The picture book pairs dreamy images of multi-cultural children, animals, flowers and trees with verse that expresses the joy young children experience in nature’s seasons. Children can see themselves in the diverse characters and can be inspired to spend more time playing outdoors and connecting to nature. Illusion of an Overwhelm by John Amen for review from the poet. Poetry. John Amen’s ILLUSION OF AN OVERWHELM offers four distinct series: Hallelujah Anima, in which the poet explores desire, self- inquiry, and ambivalence, as well as the torturous journey of inner healing; The American Myths, highlighting the intersections between politics, religion, and archetypal dynamics, inspired in part by Black Lives Matter and other progressive forms of populism; My Gallery Days, which focuses on multiple characters and overlapping narratives, offering poetic commentaries on art and the fleeting nature of life; and Portrait of Us, the poet’s celebration of enduring love and romance, presented from multiple viewpoints and timeframes. While covering wide ground thematically and imagistically, Amen makes use of searing language, the book resounding on conceptual and aesthetic levels long after the final line is read.